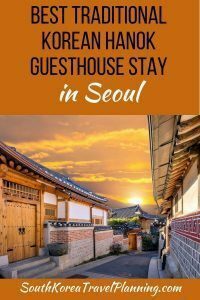 A regular question in our group is to ask for help to find the best traditional hanok guesthouse stay while visiting South Korea. You may not realise that in Seoul itself there are several hanok villages where a hanok stay is available. This accommodation is well located in the best locations to see the major tourist attractions. Here are our top picks to help you find a place you will love! Please be aware that traditional Korean hotel accommodation means that you will sleep on futon mats on the floor. If you are not used to sleeping on a futon, be aware that you may find it to be too thin – in this case you may want to request an additional futon to enable you to have a more comfortable sleeping experience. Seoul is a large city with many different districts with different vibes. if you are looking for a traditional Korean hanok stay in Seoul then the best area to stay is in the area of Insadong and Jongno-gu – in the centre of the palace district and located on the northern side of downtown Seoul! I have put together a map below which shows the major attractions in that area in red, and my recommended accommodation options in green. To see more details about my recommended Korean hanok stay options see below for details and to make your booking through Booking.com. This list includes pricing options from less expensive hanok rooms through to the more expensive stunning hanok holiday houses. As a result you can have either a cheap hanok stay in Seoul through to a more luxurious experience! The Hanok 24 Guesthouse Gyeongbokgung is located in Jongno-gu, on the western side of Gyeongbokgung Palace. The guesthouse has excellent reviews and is located within a 5-minute walk from Exit 2 of Gyeongbokgung Subway Station (Line 3). All bookings include a traditional Korean breakfast. My pick! A gorgeous Korean style holiday home with private bathroom, kitchen and laundry facilities which can sleep up to 6 people. There are separate sleeping and shared areas. Korean style double room with shared bathroom which can sleep up to two people. Korean style single room with shared bathroom which can sleep one person. The Bibimbap Hanok Guesthouse Insadong is located in Insadong, in the centre of the main shopping area, and between Gyeongbokgung Palace and Changdeokgung Palace. The guesthouse has excellent reviews and is located within a couple minutes walk from Exit 4 of Jongno 3-ga Subway Station (Line 1, 3 and 5). All bookings include a traditional Korean breakfast. There are communal cooking facilities so that you can self cater. Korean style quadruple room with private bathroom which can sleep up to six people. Korean style triple room with private bathroom which can sleep up to three people. Korean style twin room with private bathroom which can sleep up to three people. Korean style single room with private bathroom which can sleep one person. The Dalzip Bukchon Guesthouse is located in Bukchon Hanok Village which is north of Insadong and between Gyeongbokgung Palace and Changdeokgung Palace. The guesthouse has excellent reviews and is located within a 15-minute walk from Anguk Subway Station (Line 3). All bookings include a traditional Korean breakfast. There are basic communal cooking facilities so that you can self cater. My pick! A gorgeous Korean style holiday home with garden view, private bathroom, full kitchen and laundry facilities which can sleep up to 12 people. There are separate sleeping and shared areas. Korean style triple room with shared bathroom which can sleep up to three people. Korean style double/twin room with shared bathroom which can sleep up to two people. The Dahmsojung Guesthouse is located in Bukchon Hanok Village which is north of Insadong and between Gyeongbokgung Palace and Changdeokgung Palace. The guesthouse has excellent reviews and is located within a 10-minute walk from Anguk Subway Station (Line 3). All bookings include a traditional Korean breakfast. Premier (larger!) Korean style quadruple room with private bathroom which can sleep up to four people. Korean style quadruple room with private bathroom which can sleep up to five people. The Yeonwoo House Guesthouse is located in Bukchon Hanok Village which is north of Insadong and between Gyeongbokgung Palace and Changdeokgung Palace. The guesthouse has excellent reviews and is located within a 15-minute walk from Anguk Subway Station (Line 3). All bookings include a traditional Korean breakfast. Korean style double room with private bathroom which can sleep up to two people. Korean style family room with shared bathroom which can sleep up to five people.